Credit: Martin Rieser and Andrew Hugill, still from Secret Garden, Opera/Ballet, iPad screen, 2013. Copyright the artist. Reproduced with permission. Interactivity has become one of the defining characteristics of new media installation art and the use of the iPad allows a convenient, compact and user-friendly interface for a mobile audience. Now a new art form - digital opera - is emerging and our image this month is a still from Secret Garden, the world's first opera and ballet created for the iPad by media artist Professor Martin Rieser from his original poems, set to music by composer Professor Andrew Hugill. It aims to recreate a contemporary interactive version of the Eden myth in an urban environment through a virtual reality amalgam of animation, poetry and sound. This collaborative work (including input from a company of dancers, animators, programmers, technicians and students) has at its heart the iPad, that acts as both artistic material and method. The iPad serves as a virtual viewport into the Secret Garden and allows the viewer to trigger songs and dance as they navigate through the changing real-time 3D panoramic landscape of Eden. The artists' made use of the native face-tracking features of the iPad software, which detects head movements, to adjust the scene's field of view in real-time. Viewers simply stand in front of an iPad and trigger its unique scene. In exhibition there are 11 iPads mounted in a circle so that the viewer, approaching whichever device they wish, can see the scenes in any order thus creating their own non-linear narratives. The artists' point out that a partial viewing will also provide a complete experience in itself. Further, the content shifts depending upon who is participating in the circle. Audience members can in this way subtly affect the story. Such participatory art blurs boundaries between the art and the audience – the participant having an influence on both. The music of Secret Garden features vocal settings and digitally treated percussion and is distributed through headphones using Max / MSP and Abelton Live. Music consists of eleven songs lasting several minutes each as well as an extended ambient soundscape that evolves steadily over several hours. It is tied to each scene and builds its layering, intensity and spatiality as more audience members join the circle and interact with the work. The landscape is an idealised garden space inspired by John Martin's 19th-Century Mezzotints for Milton's Paradise Lost. Milton and Martin are both considered famous exponents of the sublime. This notion of the awe-inspiring power of nature continues with the Adam and Eve figures which appear as metaphysical entities in the work and seem to be constructed of stardust, their skin like a coating of fragments from the early universe. 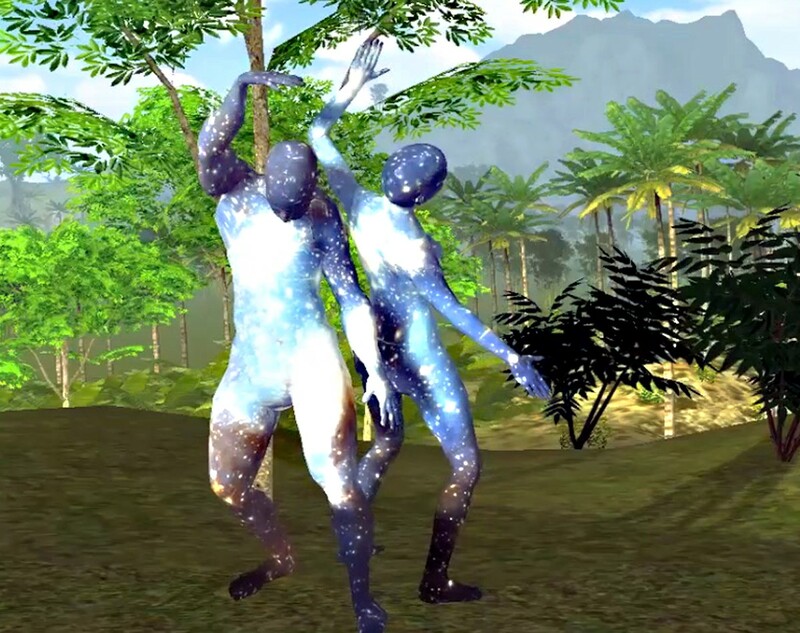 These figures were created via motion-capture using a Vicom system and are represented in the landscape as avatars. (See here for a short documentary on its making). They re-enact the narrative, through dance vignettes within 3D-generated environments. In its latest exhibition Secret Garden was viewed by over 35,000 visitors (at Museum of Contemporary Art, Taipei, Taiwan), that is many more than could have crammed into a concert hall. There is clearly enormous potential for this type of art not least in the growth and diversity of audiences in this a public art format. Andrew and Martin plan to develop a mobile phone version for iPhone and Android smartphone, to include a mixture of augmented reality and GPS location technology. This will allow the user the new experience of following a trail – perhaps through an actual garden, where 11 scenes are linked to 11 key locations. Andrew tells me that it is the nature of the experience that is different: 'The ritual component is absent, so that need has to be satisfied another way. That seems to me the major challenge.' Not relying on a traditional theatrical setting, the user experience is closer to that of reading or gaming. Conducting research into audience experience, the artists found that in the end it was the qualities of the artistic experience that affected people and lived on in their memory. Through the use of familiar, user-friendly iPads new people could be introduced to opera or ballet, traditionally considered an elite art form that is expensive to produce. And the iPad presentation is much cheaper than a conventional opera. The ability for audiences to participate in performance, even to subtly alter it, could lead to a deeper understanding of the genre. Digital opera allows the possibility of new and individual expressive freedoms on the part of both artist and viewer, facilitating a two-way creative exchange and new opportunities for the vehicle of narrative.